The Italian cities of Venice and Trieste, the coastline of the Venice Gulf and the Julian Alps of Slovenia are the ingredients for this varied and interesting walking holiday. The ‘Serenissima’ – the ‘most serene’ Venetian republic, governed much of the Adriatic. The Winged Lion of St Mark, the city’s emblem, can be seen everywhere in the region – look out for it in Trieste when you travel between Italy and Slovenia. As well as a visit to Venice, there is a guided walk down into James Joyce’s Trieste, another in the mountain resort of Kranjska Gora and a third around beautiful Lake Bled high in the Alps. DAY ONE: Flight to Venice or Treviso airports. Transfer to your hotel (40 minutes from Venice airport, one hour from Treviso) for two nights half board accommodation in Lido di Jesolo, a resort town with 10 miles of beach. DAY TWO: After breakfast, you set off for a full day excursion to nearby Venice. There is a 40-minute coach transfer to Punta Sabbioni for the scenic boat trip across the lagoon – you arrive close to Piazza San Marco. After a walking tour with local guide, you will have time to explore the world’s most romantic city, the city of canals and islands. You return to your hotel, again by boat and coach, in time for dinner. DAY THREE: Today you drive east towards the border with the former Yugoslavia. Your main stop today is Trieste, once the major port of the Habsburg Austro-Hungarian Empire. Walk 1: This walk starts on a marvellous path from the little town of Prosecco (famous for its namesake wine) which leads through the karstic plateau and the cliffs overhanging the Adriatic Sea, with a detour en-route to Monte Grisa and Vedetta, before arriving at Villa Opicina passing close to the Emperor Franz I. Obelisk. From there, you take the hybrid tram and funicular railway to Trieste, where you have some free time to explore the city where James Joyce lived and wrote many of his masterpieces. The walk is a little over 3 miles with ascent/descent of 200m/80m. After the walk, you cross into Slovenia and head for the mountain resort of Kranjska Gora in the Upper Sava Valley, for four nights half board accommodation. 218 miles today. DAYS FOUR TO SIX: In Kranjska Gora with two included walking excursions and a free day, when an optional excursion into the Austrian province of Carinthia, with its sparkling blue lakes, will be offered. Walk 2: Kranjska Gora. 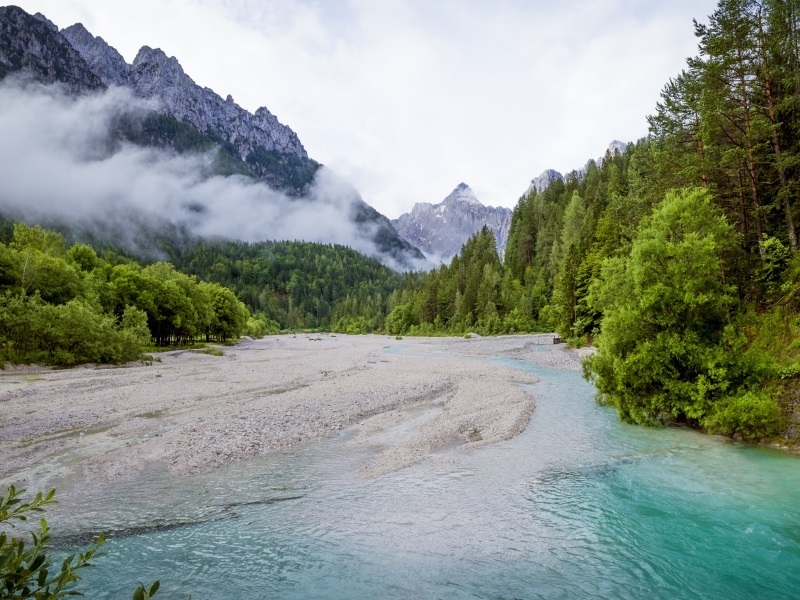 Your circular walk climbs to the village of Srednji Vrh, with great views of the mountains, before descending to the riverside and returning to Kranjska Gora. 7 miles, 200m of ascent/ descent. Walk 3: Coach transfer to Lake Bled for two walks. Firstly, you walk from Bled, passing through unspoilt villages to reach the Vintgar Gorge, with a boardwalk above the river in its narrow gorge. On returning to Bled (6 miles so far, fairly level) you have some free time before the second part of your Bled walking day, undertaking the best-known walk in Slovenia. This walk (a further 4 miles) has superb views over Lake Bled, its Castle and to the surrounding mountains. It is level apart from the climb up to the viewpoint on the hill of Osojnica. DAY SEVEN: Today you leave Slovenia for Italy. You cross the border and head to Udine, an interesting city with a long history. A Roman city in origin, it stands at a crossroads of languages and cultures: a mix of Italian, Slav and German elements, with a castle and stunning, marble, Romanesque Duomo. From there you continue back to Lido di Jesolo for one night’s half board accommodation. 153 miles today. DAY EIGHT: Transfer to the airport for your return flight. Regarding Day Three: we have been advised that the Trieste Hybrid Tram is not currently operating. If it is still not operating at the time of your visit, the journey will be by bus instead.